Rock, rat, rabbit or squirrel on Mars. NASA/MSL. 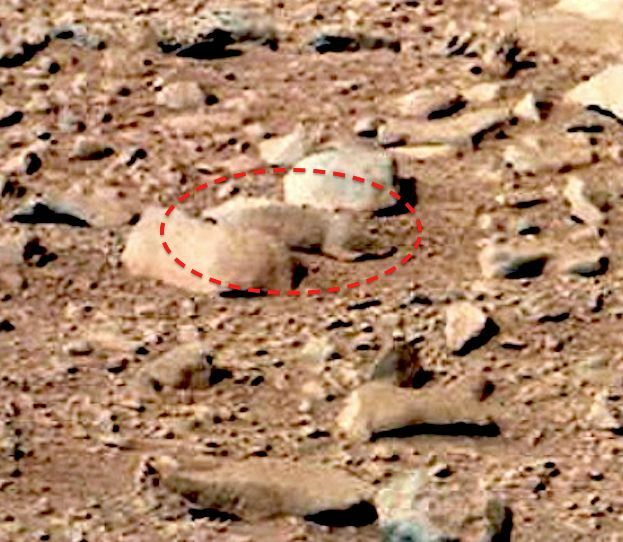 In mid-2013 a creature that looked like a rabbit, squirrel or rat in a NASA Mars rover photograph was spotted by a blogger. The photograph quickly went viral, to the point where it started attracting news media attention. This isn’t the only animal seen in Mars photographs either. A lizard and some rabbit ears have also been getting wide coverage. Several conspiracy theories have developed to explain these occurrences. One is that NASA has been secretly breeding animals on Mars. Or that it won’t acknowledge there are in fact native rabbit-like creatures already living on the planet. Another is it’s proof that the Mars footage has been filmed entirely on Earth. Peter Peryer. ‘The concrete rabbit’, 1982. Gelatin silver print. Purchased 1982 with New Zealand Lottery Board funds. O.002884. Te Papa. There is also a fourth explanation I don’t think the rabbits-on-Mars believers have considered: that a long dead civilisation cast their furry friends in solid form. Peter Peryer. 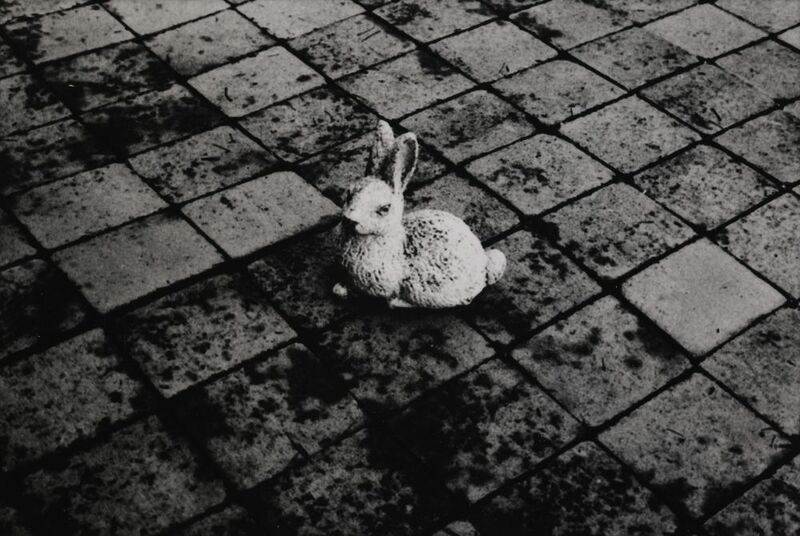 ‘Rabbit’, 2000. Gelatin silver print. Purchased 2007. Te Papa. The surface of Mars is strewn with rocks of all shapes and sizes, so it’s not surprising that some have the look of familiar Earthly objects. And once seen as something else, they are hard to ‘un-see’. This ability of the human brain to find meaningful shapes in our environment was handy for our prehistoric ancestors: good for spotting that sabre tooth tiger trying to hide in the long grass, and for seeing our own prey. Take Peter Peryer’s real-life rabbit, for example. At a quick glance you would barely notice that it is a rabbit, especially holding still like this as though it were indeed a blurry rock. Because photographs limit the amount of information we receive they can create a lot of ambiguity. They convert a world of three dimensions to two, impose a context-eliminating rectangle on a wider field of view, enforce a fixed viewing position, remove colour in black and white photography, and take out the senses of touch, hearing and smell. Photographers often deliberately exploit the information-limiting nature of the medium to unsettle our everyday habits of seeing. Tonal ambiguity and patterning – seen in the above two images – are features that run through Peter Peryer’s work. Uncertainty of scale has often been remarked upon in his photographs too. In an interview on Te Papa’s Ngā Toi website he says that this isn’t something he deliberately sets out to do. He just seems to unconsciously tap into an optical reality that is usually overridden by the brain’s determination to make sense of things. Below is an example where all three image properties of tone, patterning and scale are in operation. We might readily guess what Peryer has physically photographed, but with a little imagination it could equally be a fly-by of a tower above a large alien city on a distant planet. Peter Peryer. ‘Customhouse, Auckland’, 1982. Gelatin silver print. Purchased 1985 with New Zealand Lottery Board funds. Te Papa. Peryer’s photograph Seeing is another example. The title suggests that these are the raised Braille dots used by the blind to read. But their size is very ambiguous. Call me space-obsessed, but I half see a high altitude shot of domes in a future city on somewhere like Mars. Peter Peryer. ‘Seeing’, 1989. Gelatin silver print. Purchased 1990. Te Papa. Is there life on Mars? Well, its fairly clear that water did run freely over the planet’s surface a long time ago, and the atmosphere was once more Earth-like. And we know from recent discoveries that some microbes live in extremely hostile environments on earth, such as within rocks deep beneath the surface, under Antarctic ice, and in extremely high temperatures around underwater volcanic vents. So, maybe. Here’s the clip. There are live, plainer versions recorded over later years on the web if you find the glam posing not to your taste. By the way, if you are into David Bowie the 1976 Nicolas Roeg film The Man Who Fell to Earth is worth watching. It features Bowie as an alien who crash lands on Earth and becomes addicted to watching television and drinking gin (a fate not unknown to befall humans). This is no. 7 in my series on UFOs, aliens and outer space related to photographs held in Te Papa’s collections. Other ones include: Alien Power Source; New Zealand’s Roswell; Confusing Circles; Miniature Alien Invaders; Satellites of Love; Getting Close to the Moon; Aliens: Here Already? ; Nostalgia for the Future.